Dee’s Honeytones! It’s not about the clothes, the hair and the shoes, but it’s all about jumpin’ rhythm and blues. Dee and her band have been performing the circuit around the country and across the borders. A warm, yet twangy voice, boogiewoogie piano style, roaring Hammond sound, strong grooving rhythm section is what separates this band from the mainstream. That’s why they’re welcomed by Blues festivals, juke joints and speakeasies. Take a load of old vintage rhythm and blues, a pinch of western swing, add some rockabilly and you got yourself boppin’ rhythm and blues! With Dee-Ann (singer, piano and rhythm guitarplayer). 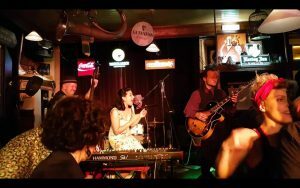 She’s teaming up with the double bassplayer Mars, completed with fabulous guitarman Emiel and Rene on drums to hit the stage and set it on fire. Together with the 44 Horns (Tim and Lodwijk on sax) they form a mini big band on request. Dee’s Honeytones play mostly original material inspired by various forties and fifties boppin’ blues, rockabilly and swinging jive greats from Elmore James, Etta James, Louis Prima, Sam Butera. Recensie: Dee’s Honeytones – Wow! Wow!